Friend just turned in his news piece, was told by his editor there was good news: He's the journalist with the last news story to appear in the Voice. That's also, the editor said, the bad news. 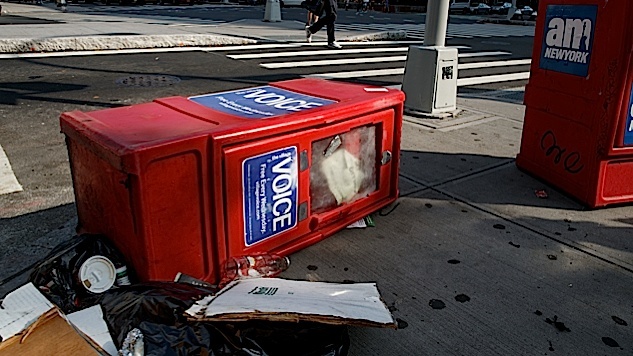 Per Gothamist, it’s more than just a terrible joke: The Village Voice, famed news and culture outlet, is shutting down. Three years after buying The Village Voice, and a year after the paper shut down its print edition, owner Peter Barbey told the remaining staff today that the publication will no longer be posting any new stories. Some staff will stay on to digitally archive the erstwhile alt weekly, which was founded in 1955 and has been a prominent cultural voice ever since. The paper’s history boasts famous names and multiple awards, including three Pulitzer Prizes. Barbey bought the Voicein 2015, and canceled the print edition last year, but as he told staff on Friday, he failed in his mission to “save” the paper. “This isn’t exactly how I thought it was going to end up,” he said.